Is it surprising which countries lead in digital? Which country leads the world in digital? If you're tempted to answer the US then you might have to think again. 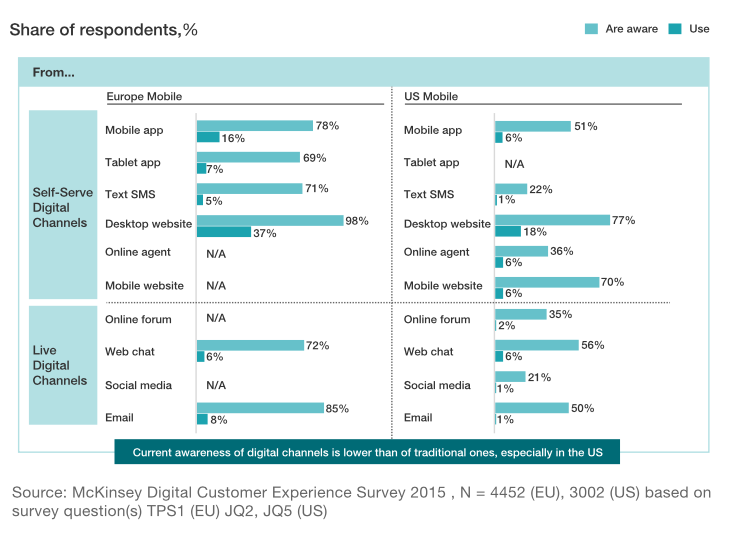 So, according to recent McKinsey research when it comes to customer preferences for digital channels, Europe is way ahead. Their research examined the digital customer experience in the mobile telecom sector and found that European customers are more open to digital services than their US counterparts. Almost half of Europeans would be happy to manage their relationships with providers entirely through digital channels, and more they're likely to use digital channels than stores or call centers, whether they're adopting a new service, reporting technical problems, querying bills, or making admin changes. It appears that European customers are more satisfied with “digital only” experiences than with wholly traditional ones, which is not true of their US counterparts who still prefer to use stores. But this isn't the case when it comes to e-learning a market worth $107 billion with a five year compound annual growth rate of approximately 9.2%. Currently the top buyers of mobile learning products and services are US, Japan, South Korea, China, and India, but the order is expected to change by 2017 when the top buyers of mobile learning products and services will be China, US, Indonesia, India, and Brazil. Today, 77% of USA companies offer online corporate training to improve the professional development of their employees whereas Europe is fast approaching 68%. Is it possible we're also seeing these trends reflected in global mobility technology's early adopters? What region has embraced bespoke global mobility technology for their company, is it Europe, APAC or the US? Who will come out on top? As always, lets share in the comments box below and let the games commence. Damian is a multi-award winning communications professional with more than two decades experience in commercial strategy and advertising roles. He’s held senior managerial and board executive roles at Express Newspapers, United News & Media, WFCA Plc, EMAP and AOL Time Warner. Before becoming Managing Partner of The Boost Partnership he specialised in ‘people engagement’ as Business Advisor for a leading CIPD HR consultancy in the UK. What distinguishes Damian in the field of ‘learning and development’ is his passion for keeping things simple and providing clear explanations for what motivates and drives effective change in people. Damian currently helps a select group of clients uncover how to create their own people strategy that enables them to provide a more productive, engaging and great place to work. He is a contributor to specialist HR, Leadership and Business Management press and Business Mentor for His Royal Highness the Duke of York’s ‘Enterprise Unit’.